Donald Trump's defense pick James Mattis has cut ties with Theranos, a troubled Silicon Valley startup. Mattis, a retired four-star general, joined Theranos' board in 2013, after retiring from the military. He's due to appear at a Senate confirmation hearing for secretary of defense next week. A transition official told CNN that Mattis resigned his positions on several boards in December, including Theranos. Theranos, founded in 2003 by 19-year-old Stanford dropout Elizabeth Holmes, had been billed as a classic industry disruptor before its technology began to unravel in 2015. A blood testing startup, the company promised cheaper, more efficient alternatives to traditional medical tests. It was valued at $9 billion, making Holmes a self-made billionaire on paper. But in October 2015, a Wall Street Journal report put a spotlight on the company's questionable technology and testing methods. It drew closer scrutiny to the company, including the fact that its board was made up of primarily military and intelligence professionals, such as Mattis. It had few people from the medical industry and no big names from the tech or venture capital world. Holmes -- whose mother was a congressional committee staffer and whose father worked for government agencies -- had met Mattis at a Marine Memorial event in 2011. Mattis was interested in Holmes' technology for use on the battlefield. Holmes had reportedly reached out to Mattis in 2012, after a military official flagged Theranos' technology to the FDA. She wanted Mattis to use his authority to dispel any concerns. Mattis forwarded the emails internally, indicating a sense of urgency in moving forward with the technology, but it never took off. Vanity Fair reported that Mattis denied any FDA interference. Theranos has had a tumultuous year, to say the least. It voided two years of blood tests, faced federal probes and pivoted away from blood testing. It's been sued by investors and Walgreens, once its biggest partner. When President-elect Trump nominated Mattis for the Defense role in December, Mattis' named still appeared on Theranos' site as part of its board of directors. His name is no longer listed. 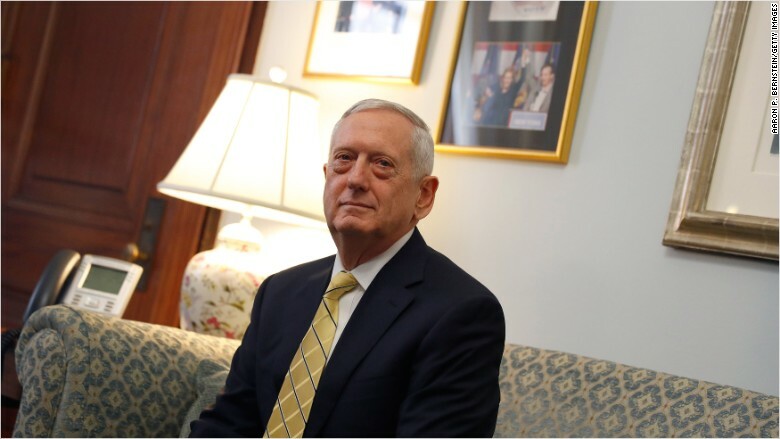 "Should Gen. Mattis be confirmed he will resign his positions with all outside entities, as is standard practice," Alleigh Marre, a Trump transition spokeswoman, told CNNMoney. Mattis still remains on the board at aerospace and defense firm General Dynamics. - CNN's Ryan Browne contributed reporting.